A study conducted by researchers at the University of Texas at Austin appears to link the popular herbicide glyphosate to the widespread destruction of honey bee colonies. According to the University of Maryland and Bee Informed, beekeepers in the United States lost 33 percent of their honey bee populations between 2016 and 2017. The study attempted to answer why the bee populations are dying. The findings were published this week in the “Proceedings of the National Academy of Sciences”. The herbicide works by attacking an enzyme found in plants and some microorganisms. The researchers hypothesized that as glyphosate damage enzymes, it would also likely damage the microorganisms a bee’s microbiome. Microbiome is the term used to describe the bacteria which populate the inside and outside of living organisms, including humans. The researchers dosed honey bees with glyphosate at levels known to occur in crop fields, household yards and gardens, and roadsides. So the bees could be tracked and later recaptured, the researchers painted the bees’ backs with colored dots. The scientists drew DNA samples from the bees’ guts to track any changes. Glyphosate was found to have “significantly reduced healthy gut microbiota” in the exposed bees, making them more susceptible to infection and death from harmful bacteria. 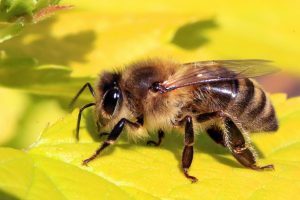 After being exposed to a type of pathogen called Serratia marcescens, nearly 50 percent of the healthy bees were still alive eight days later, while only about 10 percent of the bees exposed to the herbicide survived that long.